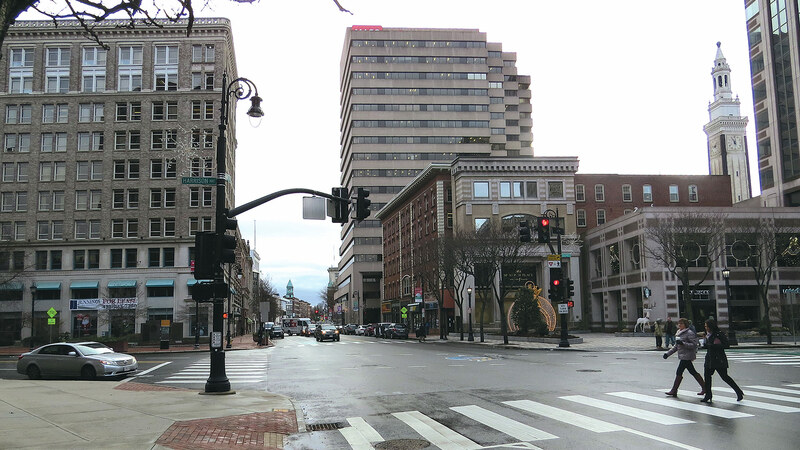 A confluence of factors — from the opening of MGM Springfield to the dawn of the cannabis era in Massachusetts — have fueled heightened interest in real estate in downtown Springfield. 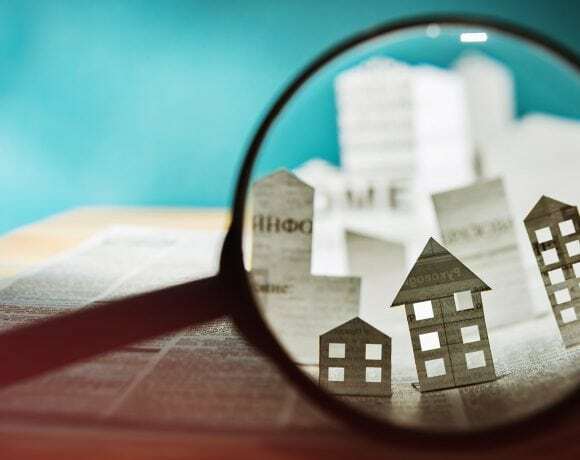 Brokers report that the level of activity — inquiries, showings, leases, and sales — is the highest they’ve seen in recent memory. Freddy Lopez Jr. says there’s a rather complex algorithm, as he called it, when it comes to locating a cannabis dispensary in Springfield. Such a facility can’t be within 500 feet of a school, he noted. Or within 300 of another dispensary. Or within 50 feet of a Class A residence. And there are many other restrictions, as well as a host of hurdles to clear locally and with the state, just to get the doors open. 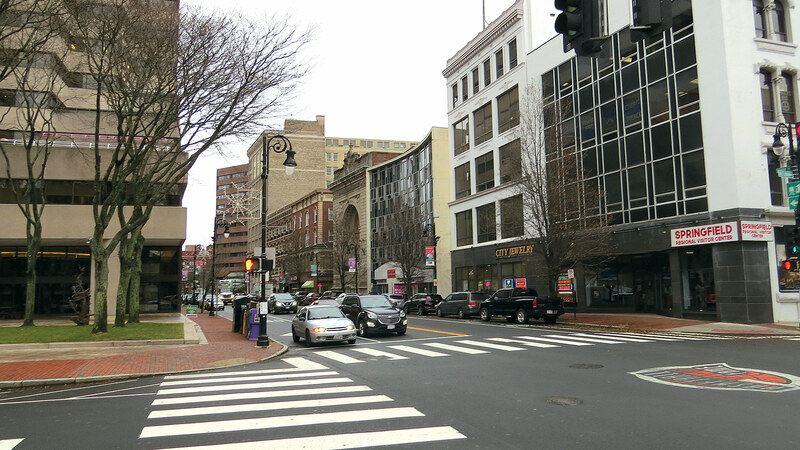 But this rather high degree of difficulty doesn’t seem to be stopping many people from trying to get in the game in downtown Springfield — and at other locations within the city, said Lopez, a broker with Springfield-based NAI Plotkin. He said he’s lost count when it comes to how many properties he’s shown to various parties, and noted that the interest is constant and only increasing, as desire to be part of the cannabis wave, if you will, intensifies. 1665 Main St., recently sold to a party interested in converting it into a cannabis dispensary. 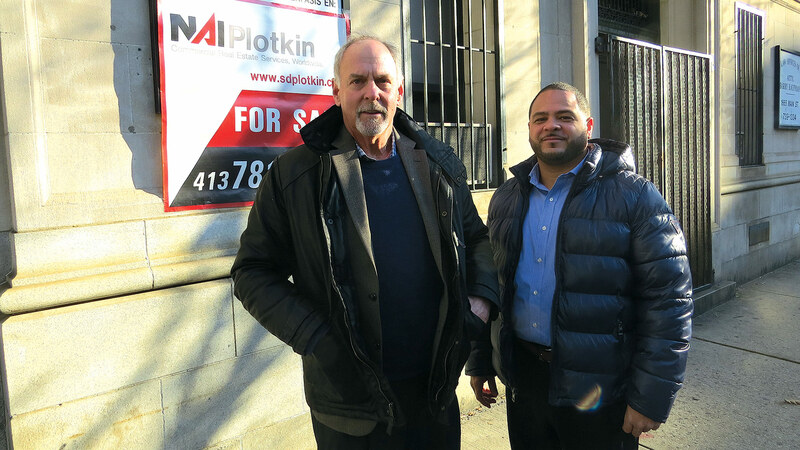 Evan Plotkin, left, and Freddy Lopez Jr. of NAI Plotkin, which brokered the sale. The Main Street property, located across from the Hippodrome and a block from Union Station, was most recently assessed at $127,600, but sold for $285,000, a clear sign of the times and an indicator of how hot the race to secure locations for cannabis facilities can, and probably will, become. “People are jockeying for position right now,” said Lopez, adding that some parties are securing options, some are leasing, and others, like RLTY, are going ahead and buying properties in anticipation of winning a coveted license. 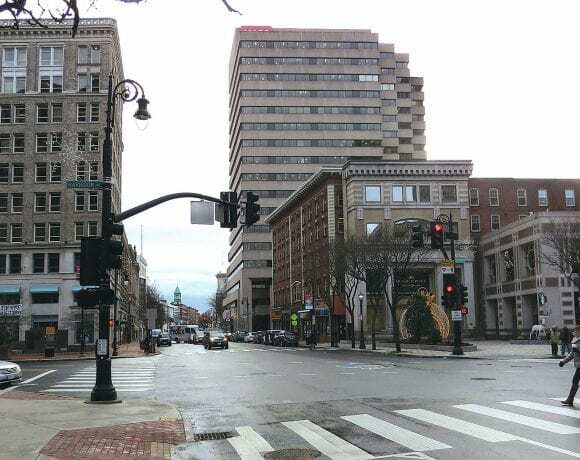 But the cannabis industry is only part of the story when it comes to growing interest in Springfield and especially its downtown, said Mitch Bolotin, a principal with Colebook Realty, based in the heart of downtown. MGM Springfield has certainly had an impact as well, spurring interest in various forms of development, from retail to housing. But there have been many other positive developments as well, from the relocation of the Community Foundation of Western Mass. to a location on Bridge Street, to the renovation of Stearns Square, to an improved outlook on the part of many when it comes to public safety. 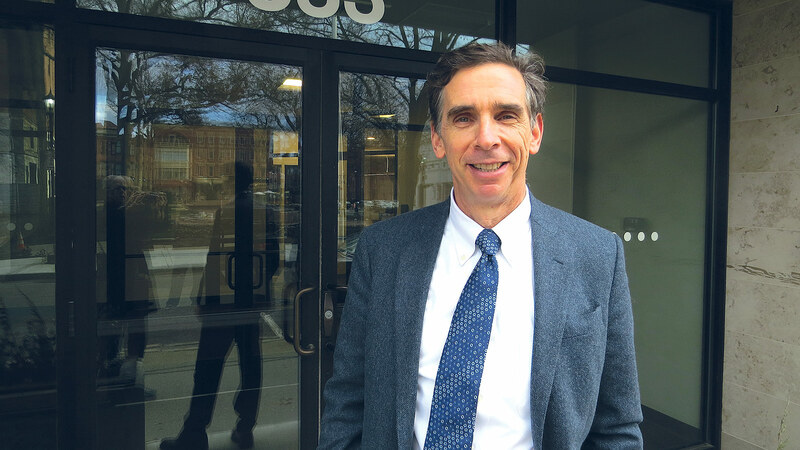 Mitch Bolotin says MGM Springfield is just one of many factors stimulating the most activity seen in the downtown Springfield market in recent memory. Demetrius Panteleakis expressed similar sentiments. The president of Macmillan Group LLC, now based in Tower Square, said the last quarter of this year has been extremely busy, and he expects that pattern to continue. For this issue and its focus on commercial real estate, BusinessWest looks at why things are heating up in the downtown market and what this warming trend means for 2019 and beyond. Lopez said he has a number of anecdotes that capture the soaring level of interest in Springfield and its impact on the real-estate market. One of his favorites concerns a party calling to inquire about securing a luxury apartment in downtown Springfield. Lopez explained that the city doesn’t really have any of those, much to the disappointment of the caller. “This person was looking to do some investing in Springfield, and I think he wanted to use this apartment as a base — he could meet people there,” Lopez explained, adding that this phone call, all by itself, speaks volumes about how the commercial real-estate market is heating up in the city, and also how widespread the interest is. Indeed, while there are many local parties interested in investment and/or development opportunities, the callers and visitors are also coming from well outside the 413. That interest comes in many flavors, said those we spoke with, adding that the cannabis industry, and a strong desire to join it, are sparking many of the inquiries. But these robust times are manifesting themselves in many ways. 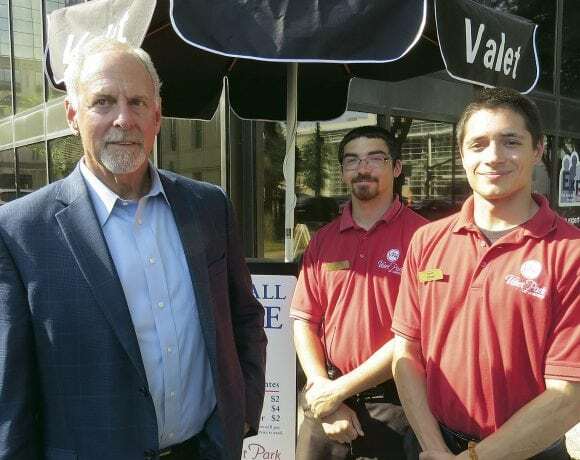 Bolotin noted that he recently secured a lease for a new food-service business on Bridge Street. He couldn’t give specifics, but said the deal involved one of the vacant storefronts on that street, damaged first by the natural-gas blast and later by explosions triggered by a water-main break. It’s an example of the strong interest in the market that he noted earlier, arguably the most activity he’s seen in recent memory. 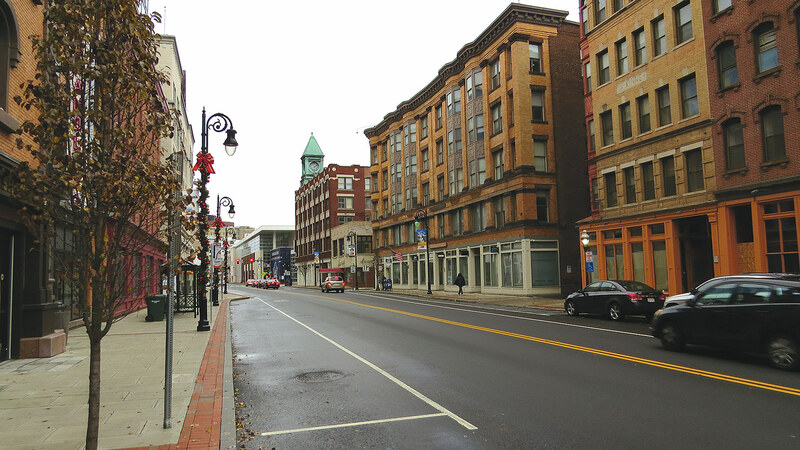 “We’re seeing a lot of positive signs in the marketplace in terms of activity and interest, leases, and sales,” he said, adding that this vibrancy is reflected in everything from higher occupancy rates in the buildings managed by Colebrook — and there are many in the downtown, including the TD Bank Center and the Fuller Block — to how many showings of properties he’s conducted in recent months. He noted that Patricia Canavan, president of United Personnel, who moved her business onto Bridge Street, Katie Alan Zobel, who relocated the Community Foundation to that same area, Tom Dennis, owner of the Dennis Group, who purchased and renovated the Fuller Block, among other buildings downtown, and Martin Miller, general manager of WFCR, who moved his operation from Amherst into the Fuller Block, are all examples of people investing in the downtown, and through, their actions, inspiring others to do so. Meanwhile, housing has become a huge area of interest, in part because of MGM and the needs of its huge workforce, but also because of rising activity levels in general and growing anticipation that the city will soon become, if it isn’t already, a landing spot for younger people and empty-nesters alike. Evan Plotkin, a principal with NAI Plotkin and long-time champion of downtown Springfield, noted the purchase of the former Willys-Overland building in the so-called ‘blast zone’ by Boston-based Davenport Advisors LLC, and that company’s acquisition of the old Registry of Motor Vehicles site, possibly for the same use, as harbingers of things to come. While interest in potential housing development grows, the cannabis industry is the source of much of the activity downtown. The brokers we spoke with said they’ve been showing multiple sites to groups interested in all facets of this business, from cultivation to retail. And while sites across the city are being explored — as many as 15 sites might become licensed in Springfield — the downtown is becoming the focal point. Lopez concurred, noting that there is a broad mix of local, national, and even international companies looking to start a cannabis dispensary or cultivation site in this region, with many focused on Springfield and an initiative known as the Opportunity Zone Program. Created as part of the U.S. Tax Cut and Jobs Act of 2017, the program provides incentives for investment in low-income communities, like Springfield. 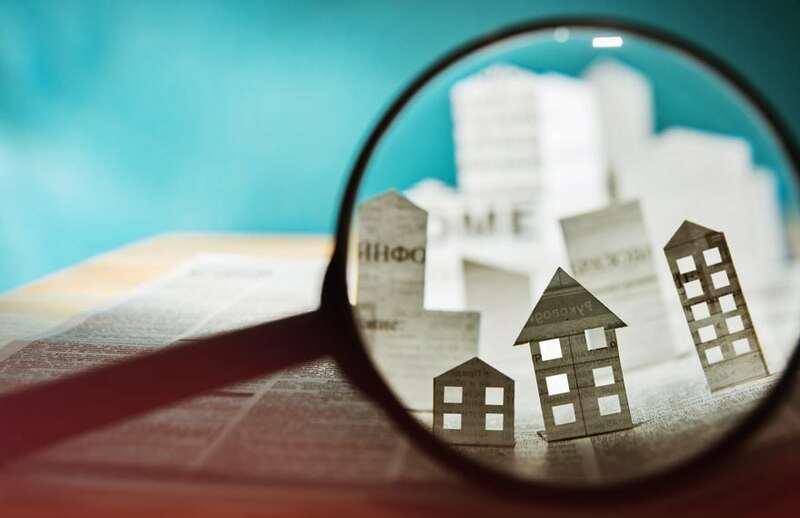 Individuals and groups looking to develop in these designated geographic areas can gain favorable tax treatment on their capital gains, said Lopez, adding that he has worked with several owners and investors in the city’s Opportunity Zone. The purchase of 1665 Main St. falls into this category, he said, noting that the acquisition is a good example of investors jockeying for position through options, leases, or outright purchases. And the race for cannabis locations should provide a substantial boost for owners of properties downtown, said Plotkin, noting that prices are moving higher as interest grows, in a movement that echoes what happened when MGM Springfield and other casino-industry players jockeyed to enter this market. “When you were dealing with a casino developer, like MGM or the other parties interested in Springfield, there was what we all referred to as the ‘casino rate,’” he explained. “They’ll pay more for real estate than the average buyer will. 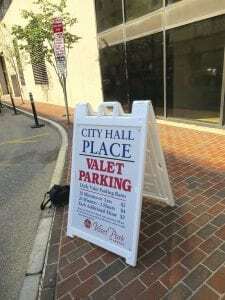 As for what the cannabis industry might mean for Springfield, Plotkin, who has traveled extensively, expressed some hope that the city might someday become somewhat like Amsterdam, a city famous for its culture, nightlife, and countless shops selling marijuana, other drugs, and related paraphernalia. Whether Springfield can become anything approaching Amsterdam — as a tourist destination or cannabis hotspot — remains to be seen. For the time being, it is a hotspot when it comes to its commercial real-estate market. There is interest and activity unlike anything that’s been seen in decades, and the consensus is that this pattern will likely continue and perhaps even intensify. Springfield and its downtown have become the right place at the right time. This rendering shows the many components of the planned $650 million resort and water park in Palmer. More than five years after Palmer residents rejected a casino proposal for a huge tract of land just off Turnpike exit 8, the property is back in the news, this time as the planned site of a $650 million water park, resort spa, and sports complex. It’s the most basic tenet in commercial real estate. Since the Massachusetts Turnpike opened in 1957, the large tract of land sitting atop the hill overlooking the exit 8 ramp in Palmer has always possessed that coveted quality. But over the ensuing 60-plus years, little has been done to capitalize on it. Indeed, among the more than 20 exits on the Pike, exit 8 is arguably the least developed. There’s a small gas station and attached convenience store just off the exit ramp, but one has to go a half mile left or right to find much commercial development, and even then there isn’t much. Still, Northeast Development saw the enormous potential in the property more than 20 years ago, and first obtained an option on more than 200 acres owned by the late John Lizak — who owned several properties within the town — and later acquired it outright soon after casino-gambling legislation was passed in the Commonwealth. An opportunity to place a casino, proposed by the owners of Mohegan Sun, at the site went by the boards in 2013, when Palmer residents rejected a casino referendum, but now the property is the focus of another high-profile initiative — one on almost the same scale as the MGM casino eventually placed in the South End of Springfield. And, ironically, it’s a concept that actually became part of the rejected casino proposal — a water park. Or a water park on a much, much larger scale, to be more specific. 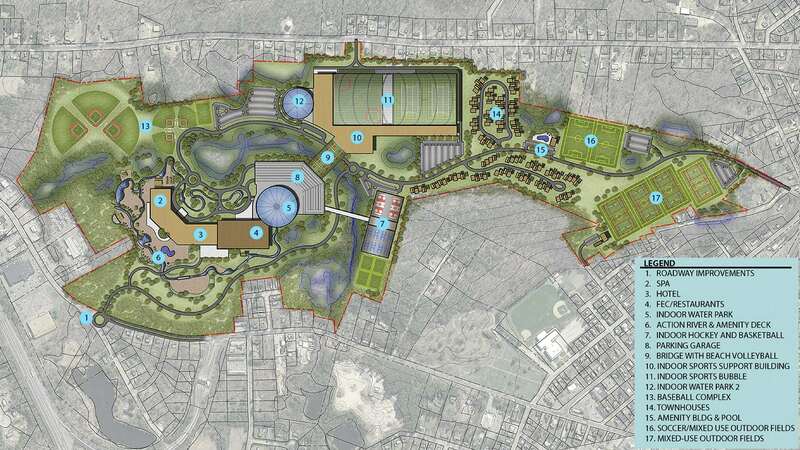 This would be a $650 million water park resort and spa, featuring everything from a man-made tubing river (if constructed as planned, it would be the longest in the country) to batting cages to athletic fields. 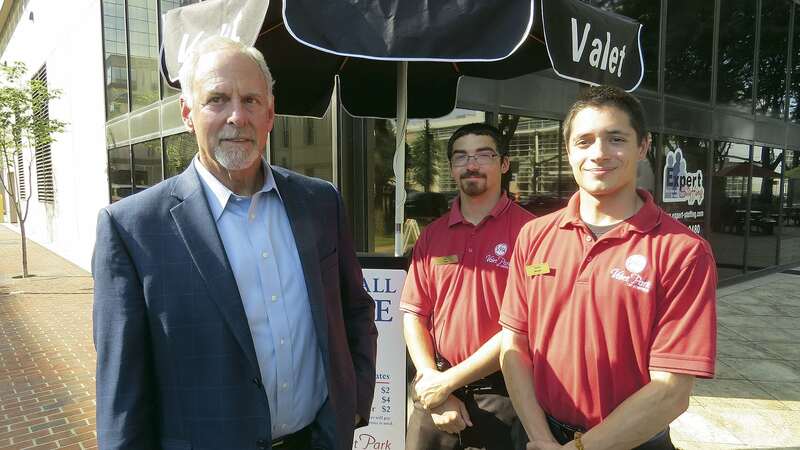 “As the casino competition started heating up, everyone was putting something new into what they were doing,” said Paul Robbins, president of Paul Robbins Assoc., a Wilbraham-based marketing and public-relations firm and spokesperson for the Palmer Sports Group. His firm has also represented Northeast Development for many years. “Doug Flutie was going to be part of Ameristar [one of the casinos proposed for Springfield], and MGM was touting its entertainment. That’s also when Mohegan introduced the concept of a water park. Those at Palmer Sports Group obviously feel the same way. Led by Winthop ‘Trip’ Knox, who has been involved with the design and construction of more than 3,000 water-related facilities for water parks, resorts, and deluxe hotels, and Michael D’Amato, who managed the construction of the later stages of the Foxwoods Resort Casino, including the Grand Pequot Tower, the group is thinking big. Indeed, the complex will feature indoor and outdoor sports facilities, a resort hotel, and two indoor water parks, as well as an indoor hockey and basketball facility, an indoor sports bubble, a baseball complex, soccer and mixed-use fields, beach-volleyball courts, restaurants, and on-site townhomes. There is demand for all of the above, said Robbins, adding that there isn’t anything like this in the Northeast, and the developers expect to draw visitors from a 300-mile radius and do so for at least 10 months out of the year; yes, the water in the tubing river will be heated. “The developers believe there are 25 million people in the catchment area for this facility,” said Robbins, who used the phrases ‘Disney-esque’ and ‘think Orlando’ a number of times as he talked about just what is being proposed for the Palmer site. Elaborating, he said there will be a large water park attached to the resort complex (again, like the Disney parks) that become part of the package of staying at that facility. There will also be second water park for day trippers, as well as a host of other facilities. Robbins said the Palmer site, while somewhat remote (which explains the lack of development at and around the exit 8 interchange), lies roughly halfway between Springfield and Worcester and is easily accessible to several major population centers. And that has made it a hot property, as they say in this business, for some time. So much so that Northeast pursued a number of different development opportunities for the site, but eventually returned to the concept that grew out of the casino proposal and may eventually replace it as Palmer biggest hope to replace the many manufacturing jobs that were lost there over the past few decades and bring new vibrancy to the community. Preliminary estimates call for 2,000 jobs, said Robbins, adding that the project might well become a synergistic complement to the recently opened MGM Springfield, offering people from outside the region more reason to come to the Bay State, and specifically Western Mass., for an extended stay. 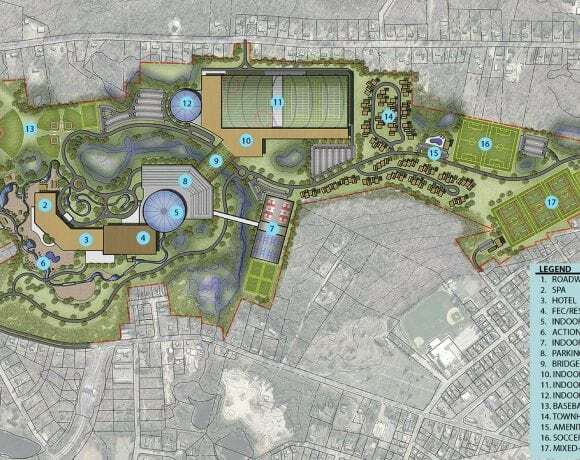 At present, there is no timetable for the development, said Robbins, adding that the Palmer Sports Group is working with town officials to secure the necessary approvals and make the project a reality.